Addison Moore: Tuesday Tease + giveaways with 3 custom Paperwhites and 60 paperbacks! Tuesday Tease + giveaways with 3 custom Paperwhites and 60 paperbacks! Thank you all for helping Someone For Me have a great release! I hope you're enjoying the last leg of Kendall and Cruise's journey as much as I did. 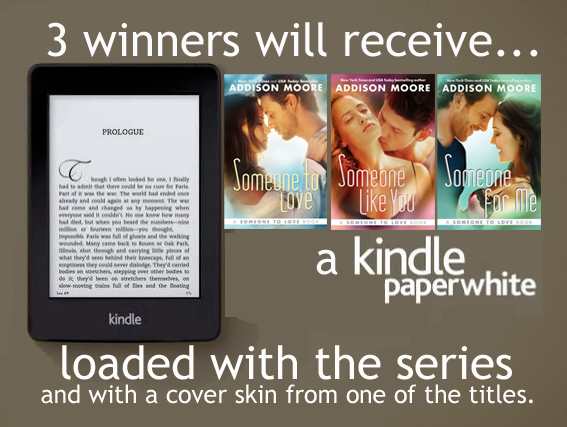 Don't forget to enter the raffle in which my publisher is graciously giving away 3 Kindle Paperwhites with custom Someone to Love skins! Link: here! And more news on the sale of Someone to Love Italian rights in... Italian! Stevie struts to the car in a short red dress, heels that stretch her legs to the moon and my entire body gyrates with approval. “Holy holy,” I whisper as she climbs in. “You redefine beautiful.” Her perfume envelops me in a cloud of sweetness. Stevie offers a slow spreading grin, the color rising to her cheeks. “You redefine me.” She says it quiet, purposeful and something loosens in me when she says those words. “Everything okay?” He gently rubs his thumb over my cheek. “Yeah, everything’s fine.” I can hardly whisper the words. It’s all I can do to keep the fire from blazing in my eyes. I hope he knows what kind of hell he’s messing with. I hope I do. I would also love to win one of those paperwhites! I am hooked on all of your books and can't wait to read what you come up with next! You are truly talented! Awesome books! and great giveaway - thanks!! I can't wait to win all. Lol. I'm so excited about reading these books. I'm especially excited to read the Celestra series. I'm hooked on those so bad. I can't wait ugh!!! amazing give aways addison! thanks so much for your wonderful work. oh I love your books Miss Moore!!! Martina Romesberg - Good luck girl! I'm rooting for you! And thank you so much for your kind words. I'm so glad you're enjoying the books! Kristi McGivern - Thank you Kristi! Good luck to you and happy reading! Pink2 - You're welcome! Happy reading and winning! julia summers - TY and I'm working on The Dragon and the Rose right now! So many new and exciting things around the bend for Skyla! lakeyre - TY! Happy reading! CheerUpUEmoKid - Thanx! Good luck in the raffle! Kim Devine - You are so welcome and, yes, my publisher is very generous! I absolutely loved Someone For Me and this series is going down as one of my favorites of all time!